PedjaBajovi? is probably not the most potent, but most definitely the most arrogant stand-up comedian in these parts of the world. Pedja wears glasses; therefore he thinks he�s smart. Wears a suit, therefore thinks he has a style. Holds a microphone and thinks he�s the man. And the worst of all he thinks that he�s thinking! Suffers because of the professional identity crisis since he was an army pilot, journalist, caterer, state official, manager, consultant, producer, etc. Born in Montenegro, grew up in Serbia, matured in Bosnia. From 2002 lives in Zagreb and loves Slovenia, especially Maribor. Maribor is where he had his first kiss with Mojca from 'BratovPolan?i?ev' school sometime in 1985. He lost his virginity in MurskaSobota. 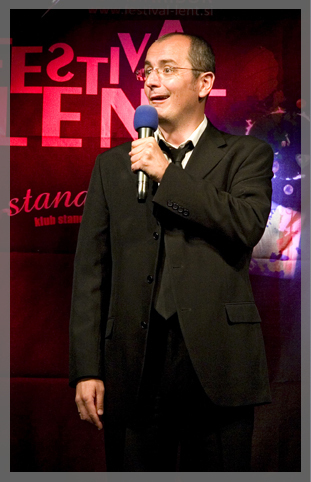 Pedja says that he is one of the most experienced Croatian stand-up comedians. He started off as a member of Sve5 group and then founded a show Standing Comedy, with which he entertains visitors weekly. He had been following stand-up comedy for over 10 years and from 2004 as a participant of such profession. In spite of his full-time employment on Tuesdays and Wednesdays at the Zagreb�s Movie Pub, he shares his view of daily difficulties and problems from jobs to his own relationships as well as a touch of global warming or Middle East crisis.